The number of accidents and crimes involving guns totaled 88 over the past seven years in South Korea, resulting in 32 deaths, a ruling party lawmaker said, citing police data. Gun crimes and accidents are not common in Korea, where possession of firearms is prohibited except for air guns, rifles and shotguns authorized for hunting and industrial purposes. The issue drew attention last week after a man killed two local government employees with a shotgun. 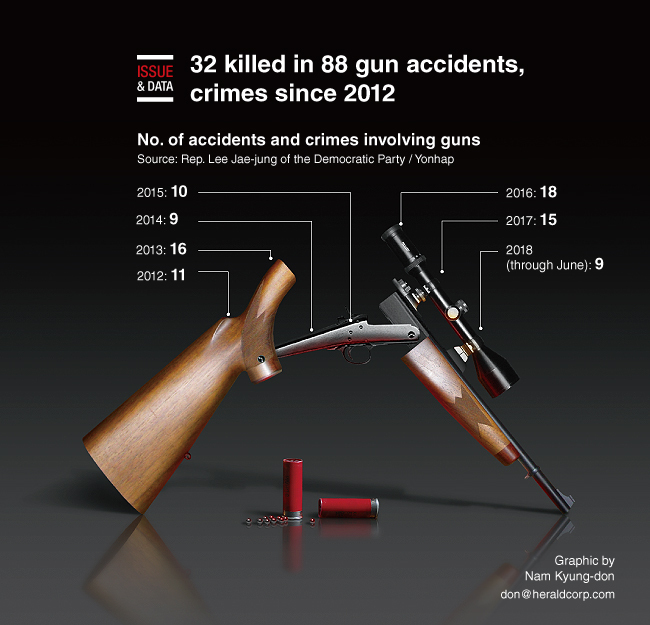 According to police data submitted to Rep. Lee Jae-jung of the Democratic Party of Korea, guns were involved in 88 incidents between 2012 and June this year, resulting in 32 deaths and 57 injuries.